Marvin William Gordon, 88, of Salem, peacefully went to be with the Lord on Friday, December 21, 2018. He was preceded in death by his parents, Luther Marvin Gordon and Lula Ada Moran; and several brothers and sisters. A dedicated husband, father, grandfather, and great-grandfather, Marvin was also a teacher for 22 years during which he received the State of Virginia teacher of the year award. He was thought very highly of by his students throughout his career and loved by many. He enjoyed carpentry and was known for his strong work ethic as the foreman for the Smith Mountain dam. 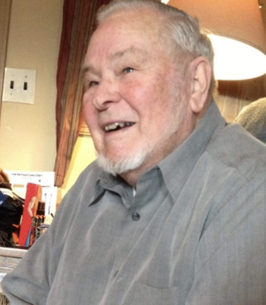 Marvin was a faithful member of Salem Wesleyan Church and worked devoutly for the congregation for over 40 years acting during that time as the vice president of the board and teaching Sunday school. Left to cherish his memory are wife of 69 years of marriage and spent his early life knowing her since the age of 3, Joyce Price Gordon; children, Kimi G. Binner (Ron) of Salem; Dawn G. Myers (Alan) of Salem, son, Timothy Marvin Gordon (“Mic”, America) of Salem; siblings, J. Edward “Ed” Gordon, Bernice Smith, and Frank Gordon; grandchildren, Matthew Binner (Kristie), Andy Binner (Katie), Alexandra Bowden (Brooks), Marvin Gordon Myers (Melinda), KelleyAnn Montpetit (Trey), Alexis Williams, and Hannah Gordon; great-grandchildren, Reyn Alexander Bowden and Luke Aerik Bowden; many nieces, nephews; and many great nieces and nephews. The family will receive friends on Wednesday, December 26, 2018 from 2 until 4 p.m. and 6 until 8 p.m. at John M. Oakey & Son Funeral Home, Salem. A funeral service will be held on Thursday, December 27, 2018 at 2 p.m. at the funeral home with a committal to follow at Blue Ridge Memorial Gardens, Roanoke. In lieu of flowers, the family requests that donations be made to Salem Wesleyan Church or a charity of choice in Marvin’s name. Online condolences can be made at www.johnmoakey.com.